The Daily Fly-By | Science | Software | Gadgets | & Social News. This is very interesting news forward on WhatsApp by my friend Ananth. The tunnel 150 meters long, 3 meter wide and height of around 12 feet is found under Maharashtra Raj Bhavan. The Bunker is spread over area of 5000sqft. Even more interesting was that "They didn’t find a single insect in the bunker"
The bunker was perhaps built at the time of Prince of Wales's visit to Mumbai in 1875. There are rooms tagged Shell Store, Gun Shell, Cartridge Store, Shell Lift, Pump and Workshop on crumbling wooden plaques. Google today announced the roll of Android 7.0 Nougat to Nexus devices. Today, and over the next several weeks, the Nexus 6, Nexus 5X, Nexus 6P, Nexus 9, Nexus Player, Pixel C and General Mobile 4G (Android One) will get an over the air software update to Android 7.0 Nougat. Expanded emoji: There are now over 1,500 different emoji built into Android, including 72 new ones. Quick Settings controls: With Android Nougat, you can actually control what tiles go where, and move ‘em around to fit ones needs. More smart battery usage: Android 7.0 Nougat the Doze feature has been made even more dozier. Android devices can now drop into lower power usage when it’s getting jostled around in your pocket or bag while on the move. LG V20 will be the first new smartphone that ships with Android Nougat, right out of the box. 2016 Olympics - The Outcome and Reactions. Congrats to Silver and Bronze Winners. But one questions asked by everyone, Why just 2 medals ? and No Gold Medal ? Olympic level sports person are not built overnight, it is a continuous process and requires time and effort. Sports bodies are expected to identify the right talent, at the right age, support and train them to Olympic level. Unfortunately, our sports bodies are not able to do this. As per the survey 92% citizens believe funds misuse and corruption is common in State Sports Departments and Bodies. The politicisation of Indian sports is the root cause for the country not being able to create world class athletes. Some athletes and coaches say chief medical officer Pawandeep Singh's standard response to most complaints of injuries has been a dose of Combiflam. There are interesting recommendations here of how sports can be improved. Think you can be next fresh face ? - OPPO Fresh Face 2016 Event. OPPO, is sponsoring Times Fresh Face 2016, a platform for younger generation to showcase their talent to the world. OPPO is giving consumers an opportunity to discover the ‘selfie star’ in them as the theme this year is “Selfie”. With “Selfie” being the theme, the participants across cities will be able to experience OPPO’s latest camera phones in selfie booths at on site venues. Candidates would be required to take selfies by the recently launched OPPO F1s which would be judged by the jury. Auditions will be conducted in phases across 11 cities in India, covering about 180 colleges and 11 malls. Interested ? Then note the schedule and visit https://timesfreshface.com/ for registration. India new law, Visiting Torrent Website, may land you in jain for 3 yrs and/or 3 lakh fine. The government of India wants to punish people who even visit a blocked URL. A new directive on the blocked websites says that the user will be fined up to 3,00,000 and will be imprisoned for 3 years under 1957 Copyright act. It is for even viewing these websites where the content is hosted. So even if you are accessing any legal material through these websites, you'd be in trouble. As usual and not to be surprized, the language of the warning is vague without any proper guidelines or announcement done by either Department of Telecommunications or the Government of India. According to the warning ‘viewing’, ‘downloading’, ‘exhibiting’ or ‘duplicating’ ‘an illicit copy of content under this URL’ is deemed as a punishable offence. This puts a question in my mind, Downloading content like movies, How is that any different from borrowing a DVD from a friend ? except in this case its online. The Message that appears on blocked sites. "This URL has been blocked under the instructions of the Competent Government Authority or in compliance with the orders of a Court of competent jurisdiction. Viewing, downloading, exhibiting or duplicating an illicit copy of the contents of this URL is punishable as an offense under the laws of India, including but not limited to under Sections 63, 63-A, 65 and 65-A of the Copyright Act, 1957 which prescribe imprisonment for 3 years and also fine of up to Rs. 3,00,000/-. Any person aggrieved by any such blocking of this URL may contact at urlblock@tatacommunications.com who will, within 48 hours, provide you the details of relevant proceedings under which you can approach the relevant High Court or Authority for redressal of your grievance". There was mix reactions as many users welcome the move, but majority, including me where not happy with such laws that is very harsh. Also it was not clear what was the role of Tatacommunications in it. Good news is that someone did more investigation on the issue and it appears you may not go to jail for visiting a blocked site. Here is what he wants to say about it. A Possible discovery of fifth force of nature. Electromagnetism, gravity, strong nuclear force and weak nuclear force are the four known fundamental forces. While doing experiments in searching for “dark photons,” particles that would signify unseen dark matter, they uncovered an anomaly that hinted at the existence of a light particle that was 30 times heavier than an electron. If confirmed by further experiments, this discovery of a possible fifth force would completely change our understanding of the universe and Standard Model of physics could be due a major revision. ManageEngine, the real-time IT management company, today announced that it has been positioned by Gartner, Inc. for its log management and SIEM solution, Log360, in the 2016 Gartner Magic Quadrant for Security Information and Event Management. The company is the only new addition to the Gartner Magic Quadrant for SIEM. Log360 is the one-stop solution for all log management and network security challenges. This solution offers real-time log collection, analysis, monitoring, correlating and archiving capabilities that help in protecting confidential data, thwarting internal security threats and combating external attacks. To help meet the most needed security, auditing and compliance demands, the solution comes packaged with 1,000+ predefined reports and alert criteria. For more information on Log360, visit https://www.manageengine.com/log-management . Bharti Airtel, today announced that customers purchasing Samsung Galaxy J series mobile device, can enjoy 10 GB Airtel 4G data at the price of 1GB 4G data. 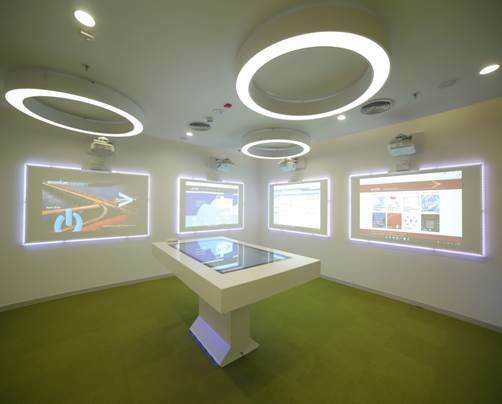 Global professional services company Accenture on Thursday said it opened a cyber centre here to expand its global security presence and help organisations tackle complex security challenges. 4 Techniques to update databases thru datasets when joins are involved. The DataAdapter provides a set of methods and properties to retrieve and save data between a DataSet and its source data store. Frequently people have asked me I am getting the following error : Dynamic SQL generation is not supported against multiple base table. How we can use data adaptor to update database when queries are based on joins. So I spent some time to write this article. Some of them say its not possible, well they are partially right , meaning there is no ready made way to do so, but one who knows how DataAdapter works then he can figure out ways of doing so. If you look at object model of ADO.NET you will find DataAdapter contains 4 properties UpdateCommand, DeleteCommand, InsertCommand and SelectCommand. The Fill method of the DataAdapter calls the SELECT command while Update method calls INSERT, UPDATE or DELETE command for each changed row. One of the great features about the DataAdapter object is that these co mmands can be set explicitly at runtime using CommandBuilder object, alternatively you can explicitly providing the INSERT, UPDATE, and DELETE commands at design time. 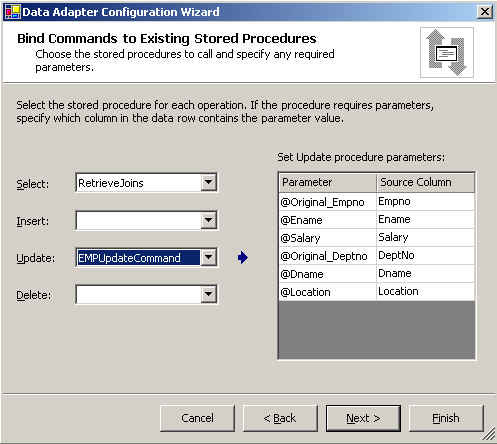 Create a new windows application and Insert DataGrid with two buttons "Fill" and "Update"
Method#1 Setting Relations: Drag and drop SQLDataAdaptor1 object and select EMP during wizard. Drag and drop SQLDataAdaptor2 and select Dept table during wizard. 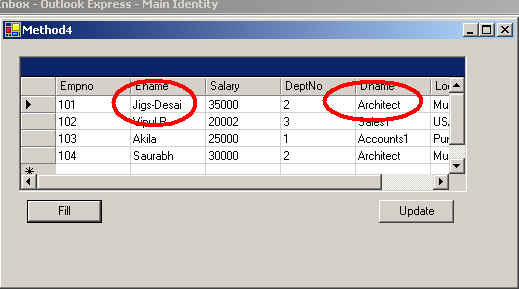 From property window of both SQLDataAdaptor1 and 2, Click on "Generate DataSet" to create typed dataset. Bring both table's data from database into dataset by calling both DadaAdaptor's Fill and then set a relation between them using DataSet's Relation.Add Method, bind the datatable DEPT to datagrid using datagrid's datasource property. (MyDataSet1.Dept ). When relation is set in dataset between two tables and if the grid is bind with parent table , datagrid is smart enough to display in a parent-child relation. This technique allows you to update both tables , but if you wish to display data from both tables in one single view, you can't, you guess right in all situations this is not what you desire. At the end wizard you will get error messages that it could not create appropriate statements for update, delete and insert. this is obvious as you are using joins in the query. Select "Finish". Select DataAdaptor and in TableMapping Properties change dataset table name to "Dept_Emp". From property window select "Generate DataSet"
Before selecting "OK" check "Regenerate parameters collection for this command" and you are almost through. don't forget to set connection object. (SQLConnection1 in our case) in Connection property of UpdateCommand. Drag and drop datagrid object and set DataSource to "Dept_Emp" table. This technique will allow you to be able to update any one underlying table. on similar lines you can write your own Delete and Insert commands. this technique is efficient and in most situations you will prefer. lets get on with something more, in some situations you would like to update more then one table. like during my .NET training one had asked me that my application requires to record changes made to tables into "Audit Tables". Well at very first I would suggest to use triggers for such situations, still if you want more control over UpdateCommand then .. Method #3 Playing with DataAdaptor events. RowUpdated : This event is raised after a DML operation on a particular row is complete. The RowUpdated event can be used to respond to errors and exceptions that occur, have a retry logic and so on. Based on your business logic if you wish not to update any particular record but continue updating the rest then uncomment the above line in green. (*Remember: this is not going to do UNDO the updates made to DEPT table). I did changes in ename of Record1 and Dname and Ename of record 2 when you click update ename of record2 will not change where as rest changes will be applied. Method #4. The Ultimate Way-Using Stored Procedure: This is what I will prefer, to take best advantage of available facility. also sometimes we want to avoid using SQL DML statements directly in our code for security reasons. Create a new WindowsForm with DataGrid and 2 Buttons (Fill and update). 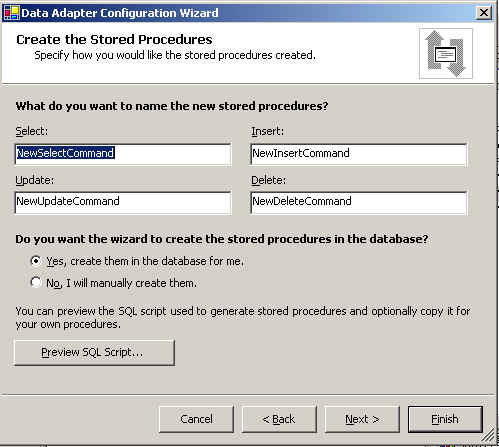 Drag DataAdaptor, in wizard select "Create New Stored Procedure" , Select one table and click next you will see the screen like below. so what we will do is go to back step and choose select from existing stored procedure. but before that lets create a simple stored procedure as shown below. Select "Use Existing Stored Procedure"
Select Right procedures as seen in screen shot. Run the code make some changes and click on update. Stored procedures offer developers a lot of flexibility with many features not available using standard SQL. ADO.NET's DataAdaptor allows us to use stored procedures seamlessly. The combination of these two allows us to create very powerful applications rapidly.